The year’s end always brings with it a tremendous sense of accomplishment. Thank you for making this year truly incredible. I can’t tell you how much I appreciate your partnership for our lifesaving work with Broward County’s most vulnerable children. 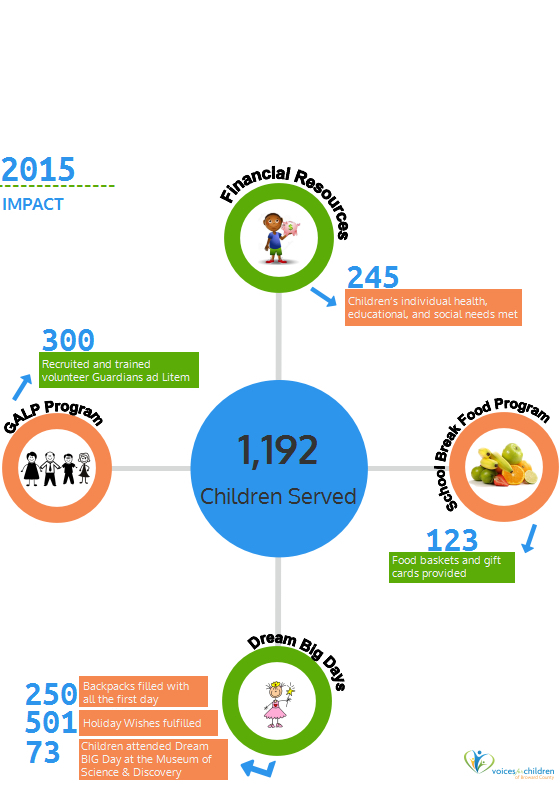 Because of you, 2,700 healthy and nutritious meals were delivered to children during school vacation breaks, 501 children received emergency resources, 3,844 children were provided necessary life essentials and opportunities to realize their true potential, and 300 community leaders were recruited and trained as volunteer Guardians ad Litem. With you, we are able to help 4,395 children last year, not only survive, but thrive. As we enter our 6th year anniversary, we hope you continue to join us on our journey in making Broward County a better place our children. Mark your calendars and please plan to join us for our annual Soaring for Children Cocktail Reception as we celebrate our success serving our community’s most vulnerable children. Our long-standing motto has been “If you can dream it, you can do it” and we have some big dreams for the upcoming year. We are working towards giving 100% of children who have an open and active dependency court case access to our services through expanded partnership with the 17th Circuit Dependency Judges and community based care agencies. In addition, through our partnership with the 17th Circuit Dependency Judges, we are committed to building a safe and child friendly environment in the new courthouse through the creation of two rooms specifically designed for children to use while waiting for court hearings. The best investment we can make is in our children. Our work has only just begun, and our partnership with you will be even more important as we work to serve every child. Our promise to you is that we will continue to work each day, with a renewed energy and passion, to transform the blessing of your support into increased opportunities for our community’s most vulnerable youth. Together, we will invest in their potential and the promise for a brighter future.